Honda UK has said it will shut down its Swindon factory for six days in April as part of its preparations for any disruption caused post-Brexit. 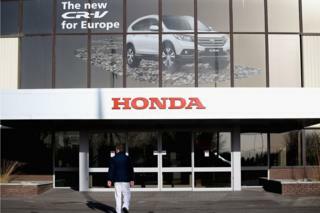 Honda employs about 3,400 people at its Swindon plant. In a statement, the company said: “We are planning six non-production days in April 2019. This is to facilitate production recovery activity following any delays at borders on parts. Meanwhile, Japanese car giant Toyota said it had “no contingency for no deal”. A Toyota spokesperson said: “We need a deal. We will have peak production in March because we have a new model, the Corolla. The spokesperson added that the firm could “increase this by hours or perhaps a few days but there is no contingency that can offset no deal and production lines would start or stop”. He said the Japanese firm was preparing for a no-deal outcome, but had not discussed relocating its Swindon plant. The firm builds its Civic model in the UK for the global market.